Who needs legs? With their sleek bodies, snakes can slither up to 14 miles-per-hour, squeeze into tight space, scale trees and swim. How do they do it? It’s all in the scales. As a snake moves, its scales grip the ground and propel the body forward — similar to how crampons help hikers establish footholds in slippery ice. This so-called friction-assisted locomotion is possible because of the shape and positioning of snake scales. 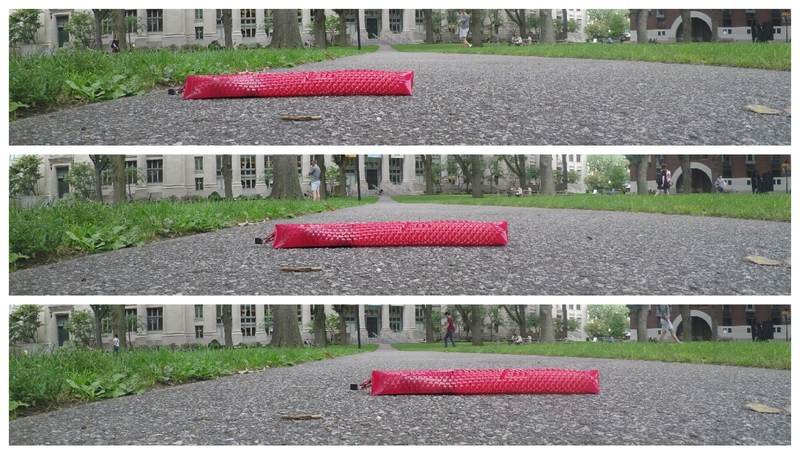 Now, a team of researchers from the Harvard John A. Paulson School of Engineering and Applied Sciences (SEAS) has developed a soft robot that uses those same principles of locomotion to crawl without any rigid components. The soft robotic scales are made using kirigami — an ancient Japanese paper craft that relies on cuts, rather than origami folds, to change the properties of a material. As the robot stretches, the flat kirigami surface is transformed into a 3D-textured surface, which grips the ground just like snake skin. The researchers started with a simple, flat plastic sheet. Using a laser cutter, they embedded an array of centimeter-scale cuts, experimenting with different shapes and sizes. Once cut, the researchers wrapped the sheet around a tube-like elastomer actuator, which expands and contracts with air like a balloon. When the actuator expands, the kirigami cuts pop-out, forming a rough surface that grips the ground. When the actuator deflates, the cuts fold flat, propelling the crawler forward. The researchers built a fully untethered robot, with its integrated on-board control, sensing, actuation and power supply packed into a tiny tail. 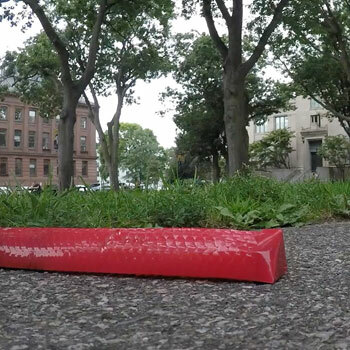 They tested it crawling throughout Harvard’s campus. The team experimented with various-shaped cuts, including triangular, circular and trapezoidal. 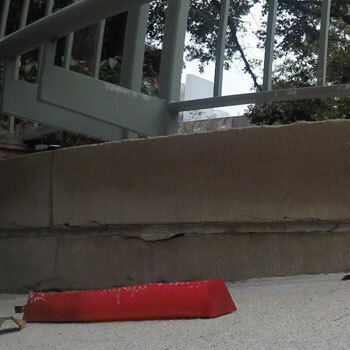 They found that trapezoidal cuts — which most closely resemble the shape of snake scales —gave the robot a longer stride. Bertoldi is also an Associate Faculty of the Wyss Institute for Biologically Inspired Engineering at Harvard University. This research was co-authored by Yuerou Zhang, Bangyuan Liu and Shmuel M. Rubinstein, Associate Professor of Applied Physics at SEAS. It was supported by the National Science Foundation. This soft robot is made using kirigami — an ancient Japanese paper craft that relies on cuts, rather than origami folds, to change the properties of a material. As the robot stretches, the kirigami is transformed into a 3D-textured surface, which grips the ground just like snake skin. 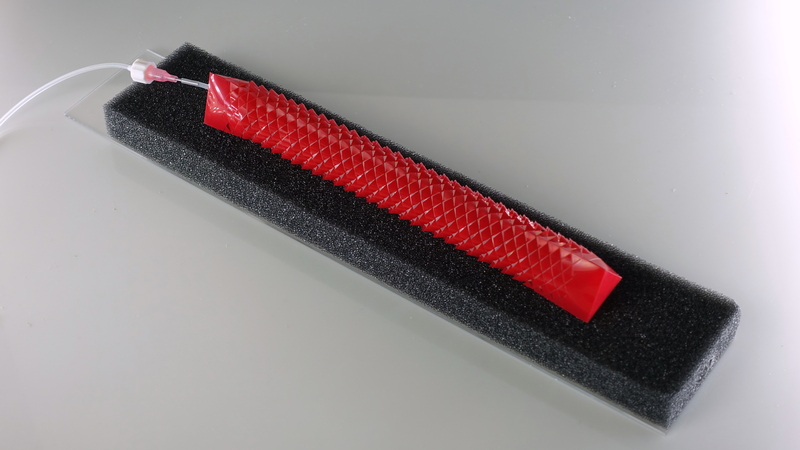 This soft robot is inspired by snakeskin. As the robot stretches, the flat surface is transformed into a 3D-texture, which grips the ground just like snakeskin. Harvard researchers built a fully untethered, soft robot, with integrated on-board control, sensing, actuation and power supply packed into a tiny tail.